it must be decorating time! I love sending kits out and imagining all the Christmas trees up and down the country with a little bit of paper-and-string cuteness on them, although today I am mostly imagining fireplaces with Christmas Tree Garlands...9 were sent out today alone! I do try to keep the stock shelves filled up but today I was tree-less and promptly whipped up a few more to make sure all the orders were sent on time, phew! the workshop looked bright and cheery today after quite a few days of overcast miserable weather ... just look at the sun pouring in through my stacks of not-yet-rolled-but-nicely-cut-and-folded mini rolls! Sadly, the downstairs entrance hall never looks cheery BUT it has now got it's very own Collection Point Barcode Sign *woo-hoo! *- I have finally bitten the bullet and decided that I need my parcels collecting rather than carrying them myself (or rather John carrying them because they are too heavy for me!) Sometimes John went by himself, sometimes we both had to carry & walk and sometimes we had to go in the car and park in the NCP to get them all there so I weighed up the time involved and costs etc and decided to have a daily collection - today is the 3rd day and it's marvellous!...it does seem a little crazy because it only takes 10 minutes to walk there but all in all a good decision made! Oh and if you're wondering why the sacks are balanced on the stairs it's because Royal Mail charge more for collections from the 1st floor so I put them all in the hall just before they come and save a whopping £200-ish a year !! things are all back to normal around here...all my shops are open again and today I sent huge sacks of parcels out to all you kind shoppers that still got your felt fixes whilst I was busy elsewhere! The meetings went well...but as usual I can not spill the beans yet....soon though, soon! just a quick note to let you know that I am briefly stopping sending out orders - don't panic though it's not for long! I've put my Etsy, Folksy, eBay and Not On The High Street shops into Holiday mode - even though I'm not going on holiday (ooh how I'd love a holiday! ), just super-busy having out of the workshop meetings (which are all very exciting!...and which I will tell you about as soon as I can!) I've managed to calender juggle and shoe horn them all into a couple of days so disruption will be kept to a minimum . PPS the photos are all the items I made over the weekend...on Saturday they were just little bits of uncut felt and by Sunday evening they were finished!! I've got Polka Dot Felt!!! I am so excited about this felt - It's designed by me, magically reproduced on the computer by my clever sister, printed by a company who are experts at that kind of thing and expertly cut into squares by John - the perfect collaboration! It arrived during the busiest week ever and I have been very impatient to get it listed and in the shop! I love being able to offer unique products - it makes the items that you make out of them even more special. *wOw* Just look at all those dots! In other shop news: I have stocked up as much as I can on Jingle Bells - my supplier has sold out and once they are gone they are gone - anyone would think it was nearly Christmas! Polka dot buttons have been re-stocked, and I have every colour again - including the hard-to-keep-in-stock Red! 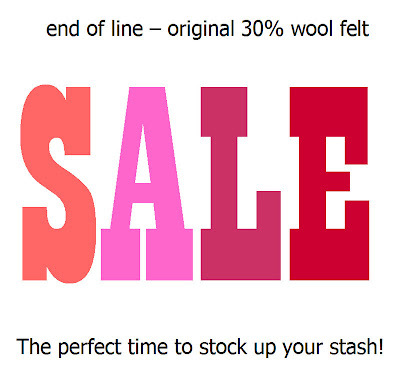 AND, as if that wasn't enough shop news in one day, I have reduced all my original 30% wool felt to super-bargain prices - definitely a good time to stock up your stash! it can all be found in the sale section - please buy lots, I need more room in my stock room! Today my favourite make was the Robin. I spent *ages* picking the buttons - it was great fun! It's been a full-on order packing day today 8.30am - now (it's now 5pm & I'm just about to go to the Post Office) but along the way I took some snaps of busy piles of crafty-things !! 17 boxes of kits have been dispatched to John Lewis today. There are a lot of large kits, oh-so many mini kits and many, many hours of hard work in these boxes. This could not have been achieved without the hard work of John (boyfriend/kit maker/felt cutter/box packer/amazing man) me (I wasn't at home with my feet up!) and two willing friends who helped. a lot. hurrah for team work, hurrah for coffee and toasted cheese sandwiches and hurrah for John, he's the best! Good Bye boxes, I hope you get there safely! Hello Blog, I have so many millions of things to tell you, things you need to know so when I look back at you next year I'll remember this week, because this week has been phenomenal - this week is officially the busiest week ever in paper-and-string history ... my to-do list has nearly self-combusted and I have little piles of 'things to do' all over the place - but Blog, remember this bit - This week has been the most fun week of working EvEr! Oh, and next year, when I'm looking back you need to remind me that I didn't quite get everything done - tightly cropped photos of things on floors = no time for hoovering!! I would love to win, they are so pretty!!! Hello, yesterday I found your blog. Everything is so lovely. What shinny and cute packs you have! Loving the ribbons. Super colours and patterns. thanks for taking part - the blog will return to normal tomorrow! there's a lot of kit making going on around here - thousands of bags have been filled with fluff - hundreds of metres of ribbon have been cut into lengths - lots of little bags have lots of little brads/buttons/pom poms/bells in them - and in between I have done some sewing too! I started 2012 with the intention of hosting a freebie every month, but since the freebie extravaganza in August/September I stopped! I'm blaming busy-ness and my birthday holiday and lack of freebie inspiration!! BUT today is the first Thursday of the month (officially paper-and-string freebie day!) and freebie inspiration has struck - hurrah! Winners: Five winners are each picked with the help of the random number generator machine. Postage: I will post your prize for free wherever in the world you are!